We are one of the leading in screw conveyor to give the solution for inclined screw conveyor, through conveyor, Twin conveyor to deliver powder, granular particles and stores in ware housing, hoppers, etc. 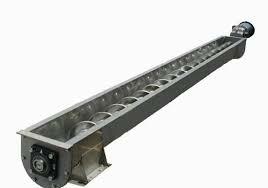 This screw conveyor is used to continue flow or as batch type transfer material from output point to storage points. It is very simply compact and free flowly design. Screw conveyor mainly used for conveying powder, granules, food products etc… in horizontal or inclined direction. The feature of this construction is helix flight design to easily move the material with low power consumption. The flight is made in one half, full and double pitch of the screw, which is used as per application.